The kaka are found in large forested areas throughout NZ and travel widely in search of food. They sometimes pass through the forest from time to time and we are hoping that in the coming years they will stay to breed. They nest in holes in trees and are very vulnerable to Stoats, Cats and even Possums which we are working to keep out of our forest so the kaka can stay around. Both North and South Island species look the same – brown/green feathers with brilliant flashes of orange and scarlet under their wings. 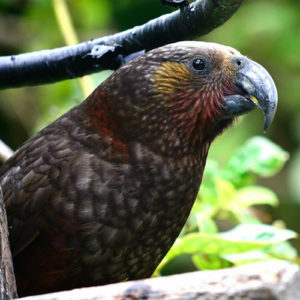 However, the South Island kaka have more vivid coloring and are larger in size. These are mainly active during the day but are sometimes active at night during fine weather or full moon. Flocks of kaka gather to socialise in the early morning or late evening. They have very amusing antics and raucous voices which led the Maori to refer to them as chattering and gossiping to one another. They play an important role in the forest by pollinating flowers, they have a brush tongue to take nectar from flowers.